Where was the first miniature golf course in the world? Who invented the formula for the artificial surface that changed mini-golf? You don't need rolling hills and hundreds of acres to enjoy the game of golf. In fact, you might think it's too easy to hit the ball through all that open space on a typical golf course. If you're up for a challenge, head to the small course. That's right! We're talking about miniature golf. If you think you're a good golfer, let's see how you do when there are obstacles, such as windmills and water hazards, on every hole! As its name implies, miniature golf — often called "mini-golf" — is a miniature version of the sport of golf. For more than 100 years, the miniature-size version of golf has been a family favorite. People of all ages can play mini-golf and enjoy the wacky obstacles that make mini-golf courses so unique. Speaking of names, miniature golf goes by several different names around the world, including "goofy golf," "shorties," "extreme golf," "crazy golf," "adventure golf" and "mini-putt." No matter what you call it, though, mini-golf means fun for the whole family. Miniature golf traces its roots back to the Ladies' Putting Club of St. Andrews in Scotland, which was founded in 1867. In the 1860s, women became interested in golf, but the social rules of the era didn't allow women to play golf with men on the regular courses. Some people thought the physical movements needed to play golf were not “ladylike." Instead, members of the Royal & Ancient Golf Club in St. Andrews built an 18-hole course of short putting greens — called “the Himalayas" (after the mountain range) — for women. 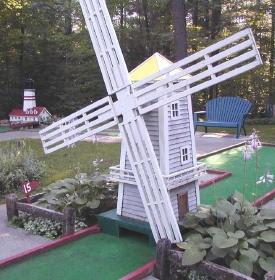 This became what many consider to be the first miniature golf course in the world. Miniature golf courses eventually became more popular when American and British hotels began to build miniature versions of golf courses for hotel guests. Things really took off in 1922, though, when Thomas McCulloch Fairbairn invented a new formula for an artificial material to serve as a green (a replacement for grass as the playing surface). His formula — a mixture of cottonseed hulls, sand, oil and dye — made mini-golf accessible everywhere. By 1930, there were tens of thousands of mini-golf courses across the United States. Some of the most popular features of mini-golf courses are the obstacles. The addition of obstacles to mini-golf courses was the idea of brothers Joseph and Robert Taylor. In the late 1930s, they began to design courses with landscaping and interesting obstacles, such as windmills, castles and wishing wells. These obstacles add a layer of difficulty to the game, while also making it a fun adventure that has delighted folks for decades. I scream! You scream! We all scream for tomorrow’s delicious Wonder of the Day! Ready to play some miniature golf? Check out the Miniature Golf Directory to find a mini-golf course near your home. If you can't find a course nearby or if the weather isn't cooperating, you can always play mini-golf indoors. Grab a bat or a stick, a few golf balls or ping-pong balls, and some empty cups or tin cans. Then just follow these easy directions to set up your own miniature golf course at home. If you can't set up your own course at home, don't worry. You can still play online. Check out this fun Extreme Mini Golf game. Today "The Beach" used a great technique to learn more about miniature golf. We asked "who, where, when, and why" questions to learn about miniature golf. We learned: WHO: Ladies’ Putting Club of St. Andrews WHERE:Scotland WHEN: 1867 WHY: Because women were not allowed to play golf. And for tomorrow... I scream, you scream, we all think it's ice cream! I think that tomorrow's wonder is about ice cream. a prefix that means "front," or "in front"